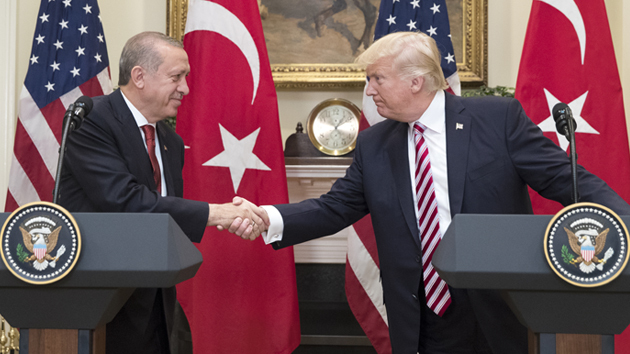 Donald Trump’s unpredictable and surprise warning to Turkey that it will suffer economic disaster if its armed forces attack Syrian Kurds has caused shockwaves in Ankara. Turkish Foreign Minister Mevlut Cavusoglu immediately responded that Turkey is “not intimated by any such threat”. On January 8, Erdogan refused to meet with the White House National Security Advisor John Bolton, who was in the Turkish capital to coordinate with Ankara the terms of a possible Turkish operation in northeastern Syria. In a tweet, Donald Trump said that “the US will destroy Turkey financially if it attacks the Kurds.” On the other hand, he advised the Kurds “not to provoke Turkey”. The US president argued that “Russia, Iran and Syria benefited more from the long-term policy of destroying the Islamic state in Syria. We benefit too but it is now time our troops returned home. Stop to endless wars”, Trump tweeted. Essentially, Trump communicated his thoughts and strategy about Syria and the US forces in the region, and stressed that a “20 mile (33 km) neutral zone” is being planned. Nevertheless, he did not mention details of how this neutral zone would be created, who would protect it and who would bear the cost. Political analysts estimate that Trump’s strong message shows the president is insisting on withdrawing about 2,000 US special forces deployed in Syriza, but, on the other hand, he is also sending a message to Ankara that he will determine the status of Syria Kurds. The decision to withdraw US troops had pleased Recep Tayyip Erdogan, but caused serious concerns to the YPG Kurds who, with the support of the US fought very hard against the jihadists and played a vital role in their defeat. In recent days, Erdogan has threatened to launch a large-scale military operation in northern Syria against members of the YPG Kurdish paramilitary organization, which Ankara claims to be a PKK branch which it calls “terrorist”. At the same time, Turkish media – with the permission of the country’s army – broadcast images on a daily basis of military forces moving to the Syrian border as part of preparations for an upcoming Ankara operation. US Secretary of State Mike Pompeo showed that he was unaware of Trump’s views in detail. In response to a question, he said “we have implemented economic sanctions in many cases, I thought he was talking about things like that. You will have to ask him. I don’t think this changes the President’s decision to withdraw 2,000 of our troops from Syria”. Turkish presidency spokesperson Ibrahim Kalin replied to the US president via twitter: “Mr Trump it is a fatal mistake to equate the Syrian Kurds with the PKK, which is on the US list of terrorist groups, along its branch in Syria, PYD / YPG. Turkey is fighting terrorists and not the Kurds. We will protect the Kurds and the Syrians from all terrorists”. In the same vein, Mevlut Cavusoglu said the YPG is the PKK’s arm in Syria, and that Ankara “does not need anyone’s permission.” Commenting on Trump’s statement, he said “no threat will intimidate us. Economic threats will lead nowhere”. He went on to say that “strategic partners, allies, do not talk through Twitter and other social media”. Cavusoglu expressed Turkey’s conviction that it has the power and ability to destroy any Islamic State forces left in Syria.